I am a big fan of the cartoon Avatar: The Last Airbender. 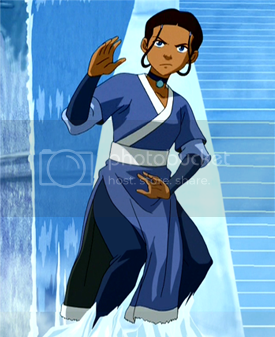 My favorite character is Katara. Naturally, then, I should cosplay her, right? Well, it's not that simple. You see, Katara is of a fictional race strongly based on and resembling that of the Inuit, whereas I am of western European decent...or in other words very very white. Now, race really shouldn't matter when it comes to cosplay, but knowing what I know about racial oppression in American media I just can't in good conscience cosplay a character of such a clearly defined different race than I am. I didn't always have such strong feelings about this issue. Sure, having studied the atrocities of minstrel shows and blackface in my theater classes the idea of darkening my skin to represent a character of a different ethnicity always made me a little queasy, but if it's culturally acceptable for minorities to cosplay “white” characters without changing their skin color, why is it so different for white cosplayers dressing as “minority” characters? Then M. Knight Shyamalan announced the casting for his live action movie adaptation of Avatar: TLA and I discovered a website called racebending.com. Now, I could have told you without visiting Racebending's website that M. Knight's casting was not only wrong but offensive. The movies are not cosplay and lead roles for minorities, especially indigenous or Asian peoples, are very hard to come by. Usually such actors are limited to token characters, so an opportunity to cast a big budget movie with all minorities in the leads would be huge. Racebending.com, however, opened up my eyes to how extensive this problem is. You see, in Hollywood, even today, there is this technique called “whitewashing,” whereby casting agents cast white people in what might otherwise be ethnic roles because supposedly a cast of all or mostly minorities makes a film a “minority film” and therefore does not get much white viewership. Now, when it comes to a movie like Barbershop I might agree with that idea, but a movie that has nothing to do with race as we know it and takes place in a fantasy world that is already popular based on its source material? I have to call BS on that theory. Unlike cosplay, in the movies only one person gets to be any given character, and to whitewash an ethnic role just because it supposedly might make the white “majority” less interested in the film is totally unfair. For me, as an actor and fan of Asian culture as well as fan of the Avatar cartoon wanting it to be retold accurately, the idea of whitewashing really hit a nerve. Sure, in cosplay the sky is the limit and you can be anything you set your mind to make, but with the knowledge of whitewashing in our media the idea of cosplaying an ethnic character just makes me feel dirty. On some level I feel like I would perpetuating the practice of whitewashing and therefore discriminating against others. Maybe on some level it's a sort of solidarity thing, a silent protest that I won't cosplay an ethnic character until minorities get better representation in the media. When you get down to it though, for reasons I can't quite articulate, it just plain feels wrong. I'm not saying it's wrong for white people to cosplay dark skinned characters, but for ME it feels wrong to do so myself. Like I said, in cosplay you should be able to dress as anything with nothing to limit you but your own creativity and hard work, but this isn't a perfect world. Some people discriminate. Some people are bullies. Some concepts carry with them baggage of what should be unrelated issues. Maybe some day in my lifetime minorities will get equal representation in the media. Or maybe I'll just get over the issue, tired of it since it doesn't so directly affect me. Whatever the case, for the moment I'm going to hold my ground in my silent protest and leave ethnic characters, even those I love, for others to cosplay.